It’s no secret that the use of mobile devices has exploded in recent years. A study by the GSMA, a trade association, estimates that 3.2 billion people (46% of the world’s population) own at least one active mobile device. By the end of this year, the total number of mobile devices is expected to exceed the global population. Handheld devices have become integral to the way we interact with the web and the world around us. More than half of adult cell owners in the US go online with their phones and nearly a third use a phone as their primary means of online access. More and more, we’re even using our devices while engaging in other activities. Nearly 40% of Americans use a phone or tablet while watching TV, usually to play games and engage with social networks. All data points to the continued rise of this “second screen” and major brands are taking notice. In the first few months of 2013, several major television broadcasts have openly embraced device multitasking and provided further confirmation that mobile devices are fundamentally changing the way we consume entertainment. The Super Bowl is frequently the most-watched American television broadcast of the year. While last year’s broadcast saw some recognition of the “second screen” phenomenon, this year’s surge in device-focused efforts points to a growing recognition of the shifts in audience behavior. When planning for their coverage of the Super Bowl, CBS worked under the assumption that the game is “appointment television”. Unlike March Madness or some smaller sporting events, the Super Bowl is an event for which nearly every audience member specifically plans to be in front of a television. Given this assumption, CBS designed their online coverage around the “second screen” use case. Rather than replacing or duplicating television content, CBS focused on augmenting the television experience by providing live stats, alternate camera angles and live social feeds. They even implemented a “subservient chicken” camera that was guided by the votes of the online audience. When the 49ers were struggling, people voted to point the camera at backup QB Alex Smith, a camera angle that producers hadn’t even considered. To improve the user experience and widen their audience, CBS made a conscious decision to provide seamless access to online content. Their coverage required no login or upfront content selection decisions. A single click could take a user from an organic search to a live stream of the game. This frictionless process improved the user experience and resulted in higher-than-expected online viewership. CBS wasn’t the only brand to recognize the growing importance of the “second screen”. Advertisers also made a push to gain traction through social media. Super Bowl XLVII saw 52 ads aired between kickoff and the game’s final whistle. 30 of those ads (57%) included a hashtag or other reference to social media. Last year, only 27% of ads incorporated similar references. In addition, several major brands developed marketing “war rooms” to allow immediate responses to game activity. These rapid response teams incorporated marketing agencies and brand managers to ensure key decisions makers were able to quickly respond to important moments in the game. Oreo was particularly successful with this approach, and served a simple ad less than ten minutes into the third quarter blackout. The ad was was retweeted more than 15,000 times. By planning for such an opportunity, they were able to harness the "second screen" to capitalize on a key moment and reach a huge audience with little cost. More than 108 million people watched the Super Bowl’s television broadcast. 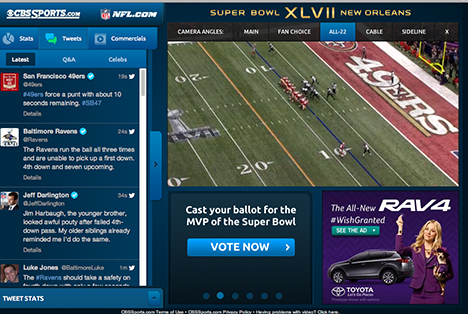 Three million users engaged with CBS’ online stream, the most ever. While that may seem a relatively small number, streaming on CBSsports.com accounted for 3% of all internet traffic on Super Bowl Sunday, an astonishing figure. Viewers were also engaged with their “second screens” outside of CBS’ content. In total, they generated 24.1 million tweets during the game, 76% more than the year before. 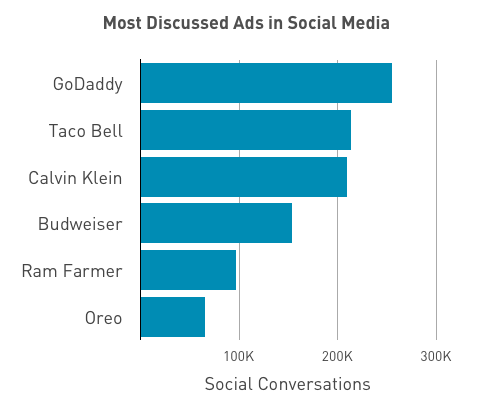 Tweets about ads accounted for nearly a third of all Twitter activity, with GoDaddy’s controversial ads receiving the most buzz (although much of that attention was negative). The Academy Awards ceremony commands a notably smaller audience than the Super Bowl and the commercials are not as renowned. However, ABC did its best to court users who were tapping away on their devices while watching the show. For the third straight year, ABC developed a companion app to provide “backstage access” to the awards ceremony. For the first time, that app supported users on Android and Kindle. Touted as “the ultimate Oscar experience", it provided content such as movie trailers, photos, and additional live video streams to expand the television broadcast. During the show, viewers were explicitly encouraged to use hashtags such as #bestdressed to discuss their favorite fashions. ABC wasn’t the only brand vying for viewers’ attention. New York Times film critic A.O. Scott streamed live play-by-play commentary, a “Mystery Science Theater 3000 type of thing”, to engage second-screen viewers. Entertainment news sources E! and the Hollywood Reporter distributed dedicated Oscars apps, and a number of second screen apps such as zeebox and ConnecTV provided special content for the show. The evening saw 8.9 million Tweets, nearly a quarter of which were sent during red carpet coverage. Top moments included the award for Best Picture (85,300 Tweets per minute) and Adele’s performance of “Skyfall” (82,300 Tweets per minute). 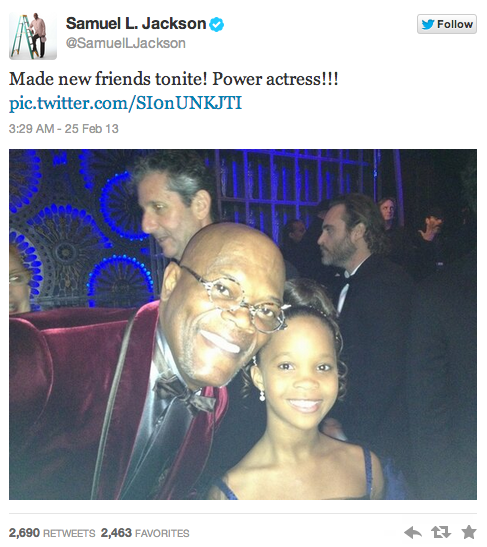 Even the stars were engaged on social media, posting message before, during and after the event. The rise of mobile devices in television may come as no surprise. We’ve seen their growing importance in other areas for years. Audiences are no longer content with a single, uni-directional content stream. They want to customize their entertainment experiences and engage with their social networks in real time. Seeing major networks and advertisers so openly court "second screen" users is yet another reminder that these devices are fundamentally transforming the way we engage with nearly everything around us. At Viget, we’ve seen growing mobile engagement on our own website and on those of many clients. We’re honing our design and development skills to produce meaningful web experiences across platforms. How have you seen device usage affect your business? How are you adapting to appeal to an increasingly mobile audience?